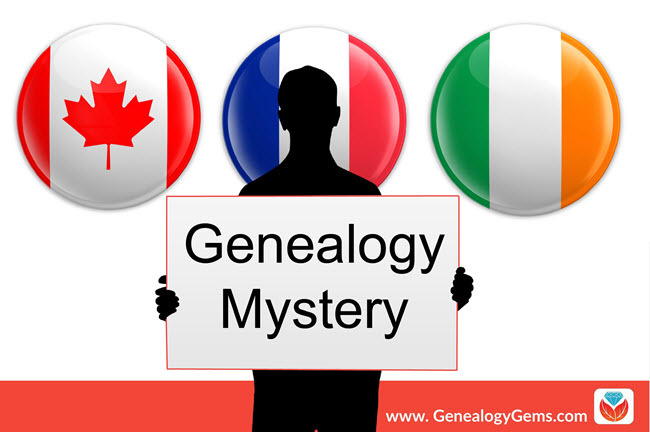 Read this genealogy mystery from a Canadian family with French and Irish roots. You’ll see the value of considering varied surname spellings, watching for other relatives in census records, using church records, and compiling clues from several sources to get a better picture of the past. 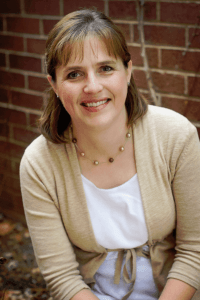 Thanks to Carolyn Tolman, Project Manager at Legacy Tree Genealogists, for this guest post. Unraveling a genealogy mystery: Methodist or Catholic? Irish or French? A survey of Canadian censuses between 1871 and 1901 established that John Lucy was born in Cumberland, Ontario in the early 1840s, and was Wesleyan Methodist by way of religion. However, neither John Lucy nor any of his children appeared in the Wesleyan Methodist baptism records in the Cumberland area. At this point, research temporarily halted as we had reached the end of a project. John Lucier enumerated in Cumberland, Ontario in 1861. Fourteen-year-old John Lucier lived in the R.P. Lindsay household. They lived in Cumberland – the same place John Lussiers listed in his marriage record. We were surprised to see that John Lucier was identified as Roman Catholic, unlikely for someone who would only three years later be married in a Wesleyan Methodist Church. Upon closer inspection, we developed a hypothesis that would explain the apparent conflict. John was listed as one of three non-family members in the household of a Church of Scotland minister. This young boy may have been taken in by Rev. Lindsay when his parents died or were otherwise unable to care for him. So, although John Lucier was a baptized Roman Catholic, he was living in a house where everyone else was a member of the Church of Scotland. He would have become familiar with and was probably following the Presbyterian tradition. John may have had mixed ancestry, with his father having been French and his mother Irish. He may have then chosen to more closely identify with his Irish roots, particularly since his wife was Irish. To test this hypothesis, we turned to John Lucy’s children and found that they indeed frequently identified themselves as having French lineage. By analyzing the later records concerning two of John Lucy’s children, we gathered evidence that the family likely had both French and Irish heritage. This supported our hypothesis that John Lucy was also known as John Lussiers and that he married Ann Hannah in 1864. A search for John Lucy/Lussiers in the 1851 census did not yield any positive results, most likely because the surviving 1851 census is not complete, so we returned to the 1861 census for more clues. Interestingly, there were two Lucier families in 1861 in Cumberland. The families of Frances Lucier and Baptist Lucier appear next to each other in the census. Of note, Frances Lucier’s wife was named Adelaide and they had a daughter, Delia. The similarity of Adelaide to John’s mother’s name – Delia – was compelling. Moving to French Catholic parish records, we discovered the baptismal record for a John Lucier, son of Francis Lucier and Adelaide Dirmont/Diamond, born in Cumberland on 30 August 1844 and baptized on 12 November 1844 at the parish St. Gregoire-de-Nazianze in Buckingham, which is just across the river from Cumberland. Baptismal record of John Lucier 12 November 1844 at the parish St. Gregoire-de-Nazianze. Using these excellent resources, we were quickly able to track John Lucy’s paternal line back 200 years to the immigrant ancestor, Jacques Lussier, son of Jacques and Marguerite (Darmine) Lussyé of St. Eustache, Paris, France, who married Catherine Clerice (also born in Paris) on 12 October 1671 at Notre Dame du Quebec, Quebec City, Quebec. There is nothing more satisfying than breaking through genealogical brick walls and helping our clients realize their heritage, perhaps especially when it is different than the family always believed. Our client may not be able to visit the Lucy ancestral village in Ireland this summer, but they may now be considering adding a stop in Paris! 1861 Canada Census (population schedule), Cumberland, Russell, Ontario, ED 1, p. 12, [R.P.] Lindsay household, http://myheritage.com, subscription database, accessed January 2017. 1861 Canada Census (population schedule), Cumberland, Russell, Ontario, ED 1, p. 7, Francis Lucier household, http://myheritage.com, subscription database, accessed January 2017. Quebec, Canada, Vital and Church Records (Drouin Collection), 1621-1968 (index and image), baptism of John Lucier, 10 November 1844, Buckingham and Grenville, Québec, http://ancestry.com, subscription database, accessed January 2017. Need help with your genealogy mystery? 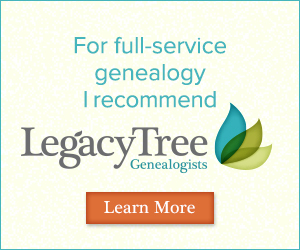 If you’ve hit a brick wall in your research and you’re ready for professional research help, we’re proud to recommend Legacy Tree Genealogists! Their team of experts are hand-picked, tested and trained on how to find the unfindable. They are based near the world’s largest family history library and also work with researchers around the globe. They are experts at everything from tracking down rare international records to analyzing DNA test results. Click here to learn more and set up a free consultation. Exclusive Offer: Save $100 on select genealogy research projects with code GGP100. This article was originally posted on August 12, 2017 and updated on March 26, 2019. For others reading this I would like to point out that there is a book “Corrections and Additions to the Dictionnaire Généalogique des Familles Canadiennes” by Rev. Cyprien Tanguay compiled by J. Arthur Leboeuf et al published 1957 & 1977 that is NOT on Ancestry and is a resource that should be checked for verification of the material in the seven original volumes. Yes, the book can be found on Google Books here (1871, in French, fully digitized and searchable) and here republished in paperback or hard cover.